Here is a rare photograph taken of him when he was not in jail. He served 18 months in prison for his side involvement in the Lindbergh Kidnapping, but soon after he got out he was back in prison again. He spent 18 years in Alcatraz Prison. When he got out, he immediately traveled to Texas and played in the 1946 US Open Chess Championship in Corpus Christi, Texas finishing near the top. Whitaker was proud of his criminal career. He liked to say that he was from Shady Side, Maryland, even though he actually lived in Washington, DC, on M Street. Shady Side is 50 miles south of Annapolis, Maryland on the Chesapeake Bay. It is unlikely that Whitaker ever lived there. Whitaker was a con man, a swindler, and an embezzler. He probably paid a bribe to get the International Master Title from the World Chess Federation ( FIDE ) in 1965, although he was undoubtedly strong enough in his prime. He was once scheduled to play a match with Frank J. Marshall for the United States Chess Championship, but he did not show up. (He was probably in jail.) Whitaker might have been briefly the strongest player in America. Whitaker once had Capablanca completely busted, but misplayed and lost. 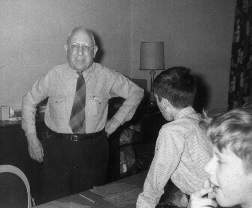 Whitaker had a plus score against Reshevsky, although most of the games were played when Reshevsky was still young. Whitaker played first board for the USA in the International Team Tournament (later re-named the World Chess Olympiad) in 1928. In the format adopted that year, the first board player played in a separate round robin event which was called the "World Amateur Championship". Max Euwe won. Whitaker finished fifth. Whitaker was a disbarred lawyer with a law degree from the University of Pennsylvania. Whitaker used to threaten to bring a lawsuit against anybody who spelled his name with two "t"'s (which is why I can remember how to spell his name). Whitaker also sued or threatened to sue the United States Chess Federation for publishing his rating. I know that Whitaker brought lawsuits against the USCF. However, I have never been able to find out how they were resolved or what they were about. This photograph was taken during the 1956 Eastern States Open Chess Championship, which was directed by Whitaker. That's me, Sam Sloan, in front of Whitaker. I was 12 years old at the time. My brother, Creighton Wesley Sloan, is in the near foreground of the picture. Berliner won the tournament, followed by Rossolimo, Lombardy, Fischer and Feuerstein tied for second. My mother and father, who were at the tournament, said that Whitaker wore his prison stripes to the tournament on one of the days. However, I do not remember this. For more about this tournament, see: The Old Clipping . Here is the game where Whitaker nearly defeated Capablanca. Capablanca was almost without doubt the strongest chess player in the world, although he did not win the world championship until eight years later. Capablanca as black played aggressively in the opening and thought he was winning a pawn, but actually he had fallen into a trap. Whitaker won back the pawn with 12. Bxc4. Capablanca did not dare to capture the bishop because of 12. .... dxc4 13. Nxc4 Qb5 14. Nd6+ Ke7 15. Ne4 Nd5 16. Bd6+ winning Capablanca's queen. After that, Whitaker declined a trade of queens (which would have secured at least a draw) and went for an all-out king side attack. To his credit, Capablanca slowly outplayed Whitaker and turned a losing position into a win. Whitaker started going down hill with 20. Be2. He should have continued the attack with 20. Rg1. This is a good game and well worth study. Whitaker, who was 23 when the game was played, missed making chess history, because Capablanca virtually never lost a game during this period. I just discovered your chess web page today and I think its great. Just the kind of irreverent stuff that I love. Anyhow I was looking at the game you showed between Whitaker and Capa back in 1913. And looking it over I wonder if Capa did not leave himself a lost position after move 6. I noticed that he moved the QP twice in the opening which is surely a mistake. I wondered if Mr. Whitaker thought of moving 7 B-N5+ which sort of suggests itself after the second QP move.? At first glance it looks like this simply leads to the trade off of bishops and who wants to do that early as white, even if you are playing Capablanca? But hey wait a minute! if you just keep following up on this line of attack it leads to all sorts of problems for Capablanca. For instance 7...B-Q2 8 Q-K3 BxB 9 QxB N-Q2 10 QxNP loses a rook doesn't it? If 7...N-Q2. 8 B-Q6 and how he's ever going to dislodge the bishop from Q6? or 9...Q-Q2 8 QxQ NxQ 9 B-K6 leads to same problem. 8: P-QR3 leads to white's knight taking the pawn on QN5 and does he get to Q6 or maybe the bishop does?. or say Capa. doesn't trade bishops: 7...P-QR3 8 P-QR3 B-R4 9 BxB QxB (9...NxB leads to B-Q6 again) 10 PxP and now this pawn on QB5 can help post the bishop at Q6 once again. Mind you I've only looked at the position for about an hour, but these are the sort of moves that just suggest themselves to me and I've found that if that is the case often times, you should follow your hunches. I'm sure you've found the same. I've found that when you see the same patterns emerge (like that bishop on Q6) it is a sure sign you are onto something. Anyhow, I didn't even play out the whole game just this part from move 6 but I noticed that you said Whitaker later missed a chance to trade off queens. It is interesting then that the above lines starts w/ white assuming that he will have to trade bishops and white's later mistake was also failing to swap. It's funny that oftentimes you see the same type of mistake repeated throughout a game, like leaving a bishop fork for your opponent and ten moves later another bishop fork shows up in the game. Well what do you think? Can you add anything to the analysis? What am I missing? Interesting huh? Whitaker tried to win the Nobel Prize! "Shady Side: The Life and Crimes of Norman Tweed Whitaker Chess Master", by John Hilbert.